S&S Worldwide’s first 8-passenger El Loco coaster is now opened at Warner Bros. Movie World on Australia’s Gold Coast. Green Lantern Coaster features a 120-degree drop, a 45-degree outward banked turn, two inversions, and all the other twists and turns of this increasingly popular model. The first-of-their-kind trains feature, over the shoulder lap bar harnesses, an onboard soundtrack, and as a thematic touch, a pulsating LED green Green Lantern symbol on the front of the coaster. Announced at the end of the summer season (for the northern hemisphere), the ride came as a pleasant surprise to wrap up the otherwise tame coaster year. 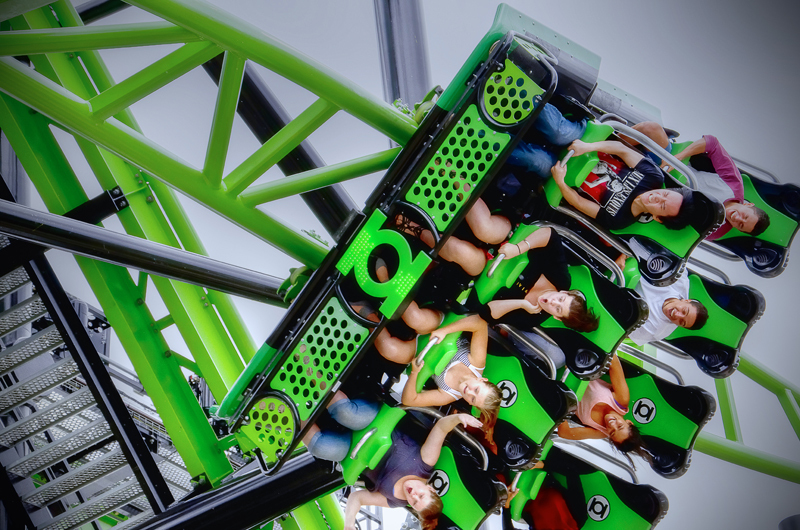 The third, and arguably best themed, Green Lantern themed coaster of 2011 is a welcomed addition the southern hemisphere’s rather modest selection of coasters and is also the park’s fifth coaster. The latest installment makes me long for one of these big-thrill-small-footprint models to be added to the west coast. I know a particular spot at California’s Great America where one would fit snuggly. And with the new larger trains, doubling the capacity, I think it is probably that an El Loco could show up are larger parks in the near future. But in the meantime, those in the area should certainly try to make a stop and experience the new, Green Lantern Coaster. Image from Ian Clark of Theme Park Photography.